The 20 grams of spec weight that Plum added to the Race 145 binding also add 20 millimeters of fore/aft adjustability to the heel piece. Doing the math, that works out to 1 mm/g and an impressive total package named the Plum Race 165. Made with the same extra-strong combination of steel, Fortal® aluminum, and Ertacetal® high-strength plastic, the ~165 gram race binding is engineered to withstand the abuse of everyday touring. And by adding adjustability to the mix, your rig can also withstand a boot sole length change without requiring a new mount. Cleverly, adding the adjustment plate only slightly increases your ramp angle (+1.5mm heel height) as the heel pedestal is lowered to compensate. 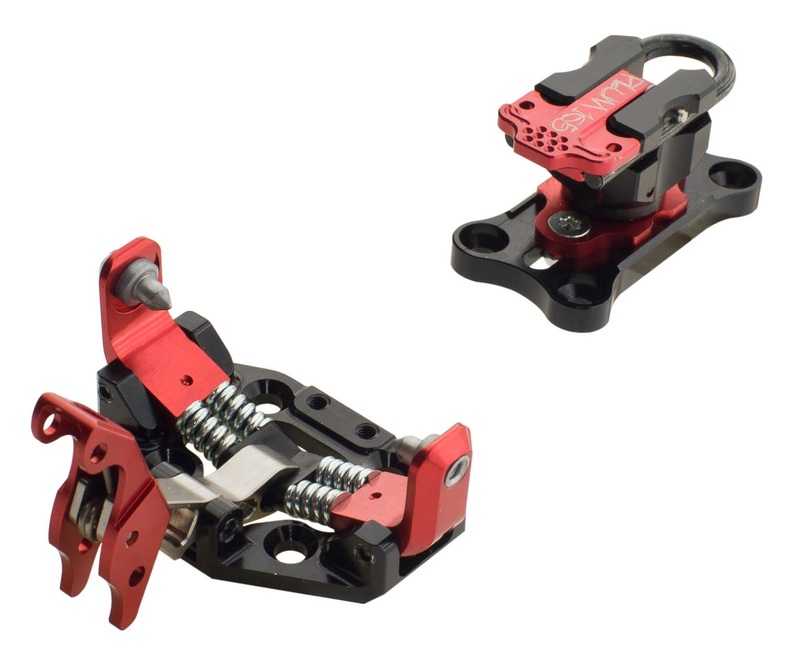 The adjustment plate also serves as a convenient boot rest when flat skinning, preventing a negative ramp angle when the heel unit is rotated 90 degrees. Simple wedge flips down to cover the heel pins and give you an extra riser option in addition to flat. Heel pieces slide forward and backward within a range of 20 millimeters, or approximately three full boot sizes. High strength steel fork in the heel adds durability to the lightweight combo of titanium, Fortal aluminum and Ertacetal plastic. Optional crampon attachment accepts most tech binding compatible ski crampons. Binding is designed to release both vertically and laterally, though like all tech bindings it is not DIN certified. Is the mount pattern of the heel the same as Dynafit ? Hi Tim, unfortunately not. See the details here. What is the approximate release value on these? I'm a bigger guy and ski my Dynafit ST's at a 7.5 or I occasionally pre-release. Pi' really attracted to these, but am worried I might pop out. It's my last concern since I've convinced myself that I don't need a high heel lifter. Hi Paddy, the Plums test on the high side as far as Race bindings go. Not ready to publish exact numbers but they seem to be in the 8.5-9 range. Bigger guys can stay in them no problem. You can send us an e-mail with your specifics if you'd like a little more guidance. Man these are sweet. Light, super adjustable and have never malfunctioned on me. I like that they keep the heel hight the same as the 145 model despite the addition of the adjustment plate. My only complaint is the adjustment screws use a funky sized Torx head that I promptly stripped out. JBO - what can I replace them with that will actually allow them to be adjustable? Hi Eric! The fore/aft adjustment bolts accept a standard Torx T25 bit, one size up from the T20 that Dynafit uses. There should have been an adjustment key in your box. I haven't found a good source of replacement bolts yet, for these or the Dynafit adjustment plates. Sounds like it's time to step up the search. Yeah, the adjustment key is small (so good for the field repair kit) but hard to manipulate and really tighten. Maybe the bolt was just soft then... But yes some replacements would be rad. So after trying to adjust, I stripped three of the four adjustment bolts. Managed to drill them all out but am now looking to replace them with something that is 1) less likely to get stuck and 2) has a better head that is less likely to strip. Any suggestions? Hey Eric, I haven't found anything yet but put in a query @ Plum about this. Eric, I have some replacement screws from Plum, though they are equally likely to strip of course. Let me know if you want me to send you some. I fondled these for a few months, but ended up passing them on. Best binding I have ever held. Race heel with integrated adjustable plate coupled with a race toe with both lock and release positions make this binding the best. I felt full confidence in these bindings to perform as I wanted at an incredible weight savings. A skimo binding is at the ideal climbing height for efficiency, because that is what racers demand. This binding gives tourers an incredibly light, safe, efficient and beautiful binding. Other than the price the biggest disappointment was that a crampon holder was an extra cost. You can buy fitness through light weight. Five Stars for the integrated fore-aft adjustability option among Plum’s three different race bindings. This brief review focuses only on what distinguishes the 165 from the 145, so see my review of that “baseline” model for more details on the common features. The only difference in the 165 from the 145 is the integration of a 20mm adjustment track. The weight savings per foot are accurately portrayed in the model names. In addition to allowing you to accommodate different boot sole lengths in the same setup, this also helps to fine tune the 4mm gap if you’re worried about mounting precision. Another benefit is that rotating the heel unit allows for a truly flat skinning position, as opposed to the slightly negative position with the 145 when the heel unit is rotating. However, all of these bindings are intended to be used primarily or even exclusively by skinning on top of the heel cover with the heel unit straight ahead. The heel pedestal and housing are shortened to compensate partially for the height of the adjustment track. So the pins and heel cover end up about 2mm higher for skiing and skinning, which can be viewer either as a positive as a negative, but either way the difference is very small. The mounting pattern is also wider and longer than for the 145, which could be a plus if you think the physics of that reduces the chance of a binding pull-out. About halfway through my use of the 165, I adjusted it for a different boot sole length. For both settings, the heel unit’s hold down screws have stayed absolutely tight.